These Farm Heroes level 419 cheats and tips will help you beat level 419 of Farm Heroes. The objective of Farm Heroes level 419 is to reach 100% growth in 20 turns by collecting 100 water drops and 50 onions. Farm Heroes Saga level 419 presents us with some very interesting problems. 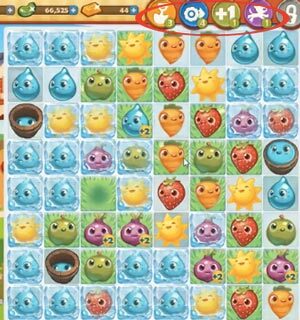 First, you need to collect 100 blue water droplets. However, a good percentage of your blue water droplets are frozen in ice blocks. And at the same time, you will need to overflow the water buckets to generate more blue water droplets. It’s a real paradox, but there is a plan. Begin Farm Heroes Saga level 419 by breaking the ice closest to the bucket. Remember, you will need to make a match with whatever cropsie is stuck in the frozen block of ice. This will fill several needs as it will crack ice, fill a water bucket and most importantly, open up the board. 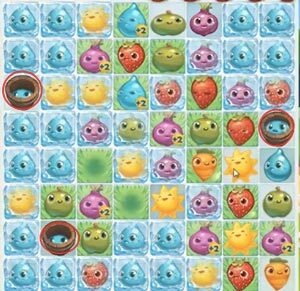 As you crack the ice, the board will open up and give you many more options to work with as the board will fill with candies. You can also turn to your shovel booster. You shovel booster can crack up a block of ice. The Shovel booster is also amazing because it will not use up any of your moves. 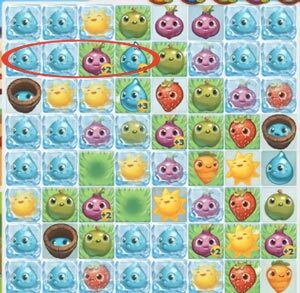 As you open up the board in Farm Heroes Saga level 419, you will see that need more blue water droplets to reach your required amount. In order to overflow a water bucket, you will need to make three adjacent matches alongside of it. As you do this, try and make sure the matches count towards your required cropsies of blue water droplets and purple onions. It’s also a good idea to continue to crack any remaining ice and overflow buckets at the same time to conserve moves. Level 419 Cheat #3: Get those boosters going. Because of the large amount of ice, Farm Heroes Saga level 419 may need the use of boosters to complete. The shovel booster will be the best booster to use because of its ability to not use up a single move. This of course makes it very efficient. Use the shovel booster to remove any cropsie or chunk of ice in your way of making a match with blue water droplets and purple onions. You can also look to the big guns and call out the tractor booster. The tractor booster will remove an entire row or column by steamrolling anything in its direct path. You can also use the plus one bonus booster, which will come in especially handy considering how many cropsies are frozen. The plus one bonus booster will tack on an additional value point to all of your required cropsies. This way, any match you create of blue water droplets and purple onions will be worth that much more.